A Dina é de Portugal e realizou um SVE em Lisboa em Portugal. Esta é a partilha da sua experiência! (EN) Dina Reis, Portuguese, 27 years old, International Relations graduate, with a Post grad in Environmental Issues and Globalization. A volunteer is a new kind of nomad, detached from almost all, looking for someone to help, and seeking to be constantly learning. The beginning of the adventure is always uncertain. You never know what to expect before you arrive.You just feel the need to go, in some cases leaving everything behind, not knowing where you will end up, but with the feeling that you arrived to the right destination with all the ambition to change the world. I did exactly the same when I left home; without much knowledge about Serbia, Niš town and my project but with an open mind and the will to do something. I soon realized that being in another country, with different culture, language, habits, and food is a non-stop pressure job. One day is never equal to the other. The daily tasks may not be so demanding, but certainly you will have a party to go during the night and you will end up with few hours sleep.The time flies in front of you without you realizing it. The more you want to do, the smaller the days will seem. But that shows me that I´m alive, I´m learning to overcome my own limitations and to overcome all the cultural barriers that I encounter every day. I’m easily mistaken to be Serbian because of my features, but when I ask “Do you speak English?” the mystery vanishes. I struggle to be understood and to understand. Most of the times I can. The communication through gesture is a powerful one and a smile too. Day by day I’m learning to recognize signs, words, and expressions; for this the Serbian classes are very helpful. The activities that I do for my host organization in Niš, – LDA (Local Democracy Agency) allow me to develop my professional and personal skills. It has been a very empowering experience. My project is related to sustainable development and globalization, through the organization of workshops activities at local schools and in LDA office. Maybe you are now wondering what kind of program is this. Where it´s possible to go abroad, to have language classes and to do voluntary work? This is the EVS – European Voluntary Service program. What is EVS-European Voluntary Service? Despite having some experience in the participation of European exchanges, the desire to be a volunteer for a longer period was always in my mind. Not knowing very much about EVS, I decided to talk to a recognized organization with volunteering experience from my country before I found this project in Serbia. The European Voluntary Service is one of several Youth in Action programs of the European Union which has among other objectives, to promote active citizenship, mutual understanding between young people from different countries, to develop solidarity and promote tolerance in order to foster social cohesion through non formal and informal learning activities. Everyone between 18 and 30 years can apply to an EVS project. The volunteers are selected regardless of their origin or context. A project can last from one till twelve months. The projects cover so many different areas such as culture, youth, sports, social service, cultural heritage, arts, civil protection, environment, development cooperation, among others. Can be carried out in countries of the European Union or partner countries. It’s only possible to do one EVS project. Only the volunteers that participated in a first project lasting up to 2 months can participate in more than one EVS project as long as the total duration of the two projects doesn’t exceed the 12 months. The volunteer has the right to have a pocket money to support the cost in the hosting country and all the travel costs, food, and accommodation are supported by the European Union.The entire process of selection, approval,agreement on activities to carry by the volunteer, travel and arrival must be arranged between a sending organization (from your country of origin), a Host organization (from the country where you want to go) and the volunteer. 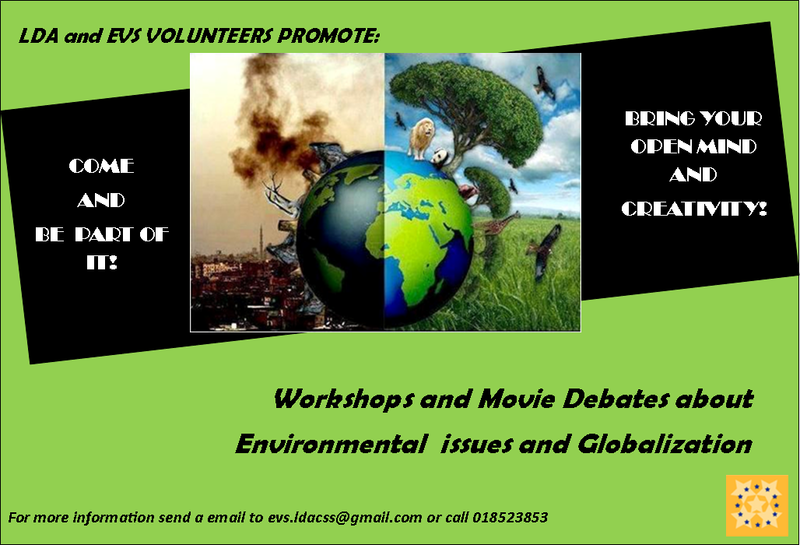 My project in the association Local Democracy Agency, was organizing activities regarding environmental education, sustainable development and globalization,through workshops movies sessions and debates with youngsters of the local community. The objective of these activities was to raise awareness to the importance of changing attitudes and behavior at all levels to respond to contemporary challenges relating to sustainable human development. : It has been a very stimulating experience for me. I visited some schools to implement these activities and luckily some schools have opened their doors for me I faced a new challenge: being the person ahead of a group of youngsters, eager to learn more. I’m sure both sides have learned, I improve my organizational skills with groups and they have learned to be more aware of environmental issues, a topic that is still not a priority in Serbia. I also organized some activities in the office of the association LDA. But I came across with some obstacles that I didn’t expecte: people’s participation. Not many people attended my workshops, I felt like a lot of people showed their interest to come, but in the end few people appeared. That was a bit disappointing because I was full of expectation, but I could work with the one’s that came and we could have great debates about what is happening in the world and specially comparing what is doing Portugal, Serbia and Europe regarding environmental issues. The work of a volunteer is always very important but also very ephemeral in time. I fell like my work isn’t done; it was just the beginning of something. There is still much to do, but I’m happy to have given my contribution. I hope the next volunteer continues that work. Many people ask me “Why Serbia?”. I answer “Why not?”! I didn’t want to go to a place very popular, full of tourists, I wanted to go to a brand new place still new for the rest of the world but full of traditions and history, and Serbia could provide me that. I had a particular interest to discover more about Serbian culture, people, history to understand more about this part of Europe so close but so different. Discovering Serbia and Serbian people was a truly unique experience for me. 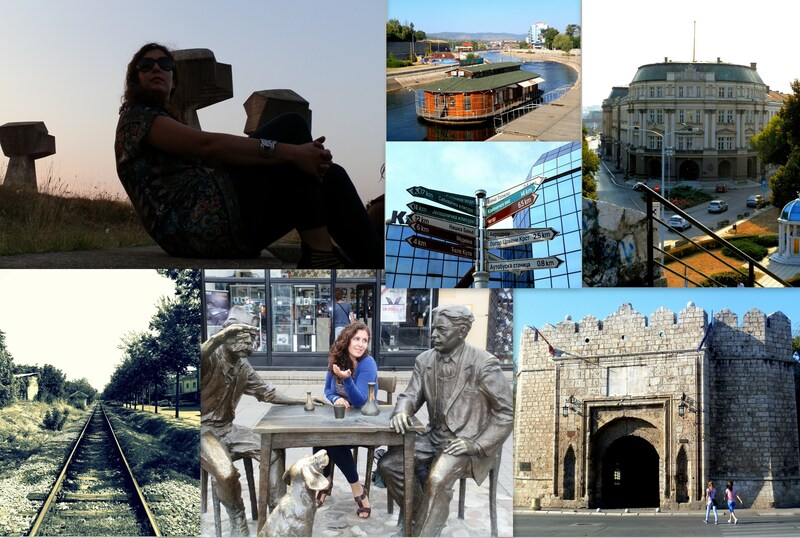 Niš in particular was the city where I lived two months and where I could be in contact with the local people, traditions, and food. Niš is a very artistic city. The city breathes music with a lot of pubs to go and a very busy nightlife that suits everyone’s tastes, from rock to classical. I had the opportunity to visit several historical places like the Concentration Camp, Bubanj Memorial Park, Niška Banja, and to taste the traditional food in a Kafana. Along the way I met a lot of helpful and friendly people that I will always remember. I learn a lot with this experience and I will take a lot of knowledge with me to use not only in the professional field but in my daily life. It’s now time to go home. It’s always a bittersweet felling leaving a place, but I leave with a heart full of good feelings about the people and the place and with a great experience that I will have memories for years and years. Maybe one day I will come back. May 21, 2013 in SVE - Envio.